MORNING MANNA : Feb 21 - WHAT IS TRUE BLESSEDNESS? Feb 21 - WHAT IS TRUE BLESSEDNESS? “Blessed is every one that feareth the Lord; that walketh in His ways” (Psa 128:1). Moffat’s Bible renders ‘walketh in His ways’ as ‘liveth His life’. Those who live the life of God or, those who live near to God are the truly blessed people. True blessedness is nearness to God. In the sight of God, a blessed man is not one who is rich, famous, educated, talented, healthy etc., but one who lives close to God though perhaps not having riches and other material possessions. A blessed marriage does not mean that the couple is well placed in society having a big mansion, wealth, health etc., but that the couple lives close to God in spite of all the problems they face in life. 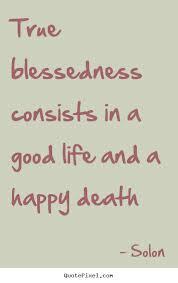 A blessed life (long or short) is one that is lived close to God. Your life’s problems can either bring you close to God or take you far away from God – it all depends on your attitude towards the problems. Two thieves were crucified with Christ. Both were thieves, both were punished the same day. Both saw Jesus in the same way – hanging with them on the cross and both heard the words of Jesus. However, the penitent thief went to paradise to be close to Jesus for ever and the other went to tormenting hell to be far away from Jesus for ever. Dear reader, today and every day will be a blessed day for you, provided whatever happens that day brings you close to God. In the same way, every problem in your life will be a blessing to you, provided you take those problems as a means to bring you close to God. “He exalteth the horn of His people, even of the children of Israel, a people near unto Him” (Psa 148: 14).